At Grand Falls Chiropractic Wellness Centre, we offer high-tech COREscore™ assessment with our Insight Subluxation Station. Your COREscore™ represents a powerful and simplified way for us to measure and report your dramatic changes while under chiropractic care. By using three distinct sensors we can measure the efficiency of your central nervous system and determine how chronic stress is affecting your overall health. You can expect to receive your assessment during your first visit to our office. 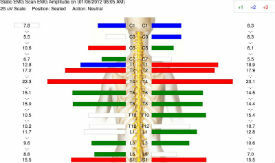 This exam evaluates the function of the muscles that support and move your spine. These muscles are controlled by the motor nerves running within it. This test measures how much energy is needed to maintain your posture and how it is distributed throughout the muscles. If too much energy is used when your spine is out of balance, this test score will be lower than normal. Muscle fatigue and poor energy distribution are signs of a person’s entire health being under stress. By precisely measuring muscle activity, your progress can be followed as your spine and nerves releases tension. The data from these tests are compiled and then calculations are made to create your Core Score™. Your COREscore™ is based on a scale from 0 – 100. The higher the number, the better the communication along those important nerves. Your score will tell us how much interference is in your communication core and how we can begin to help you. Your score will be re-measured periodically to measure your progress as you move toward 100! Ready to get your COREscore™? Contact us today to make your appointment.